Shale gas development has increased its share on energy markets not only in the US but expanding globally, regardless of the controversial debate on the environmental and social impacts. A strong transnational social movement, uncertain about the risks, and concerned for its impacts on climate change, has risen to oppose what is framed by them as “fracking”. This research uses political ecology to understand those tensions, with a case study on the Bowland Shale, county of Lancashire, UK, to capture how the movement is performing on the quest. The analysis was conducted comparing a classic approach derived from social sciences framework, employing concepts such as organizational capacity, strategic framing, lifecycle analysis and political opportunity structures. The findings reveal that, the social movement is in an advanced stage and close to its decline in England, where resistance has increased for about 7 years and the context seems favourable, hence the ongoing exploratory activity that is already shaking the ground, literally. 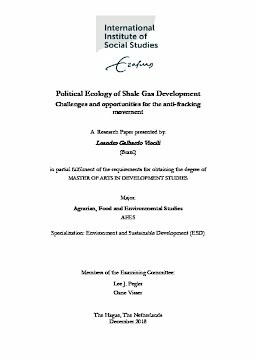 It further concludes that relying only in social science framework was not satisfactory to explain why the anti-fracking was not able to halt shale gas development, even when similar conditions were observed in different spatial contexts, revealing the relevant contribution given by political ecology perspective. Thesis Advisor Pegler, Lee J.